The Returned and Services League (RSL) papers in the National Library of Australia constitute about the largest of that cultural institution’s massive collection of manuscripts. And about the messiest and worst organised. You can look at the references in GL Kristianson’s pioneering The Politics of Patriotism, from nearly 50 years ago, and go up one floor in the NLA and find the same documents pretty much as Kristianson used them. Maybe the folders and ribbons are new. All of that may be some sort of metaphor for the RSL itself. We make no comment, though the relatively recent work of Geraldine Doogue, Phil Griffiths and Martin Crotty is all worth a look on the organisation then and now. Honest History was interested in the RSL papers for what they might have turned up about the provenance of the alleged ‘Ataturk words’ of 1934. They were not much use at all in this regard but we did find a couple of other interesting things. In one case, it was very much the dog that did not bark. Update 26 April 2016: further research has filled an important gap noted in the original article. Bill Yeo (1896-1972, later Sir William) was president of the NSW Branch of the then RSSAILA from 1949 to 1969. He was at Gallipoli in 1915 and later served in France and Belgium. In 1960, he led a world tour of about 45 veterans and their wives to old battlefields and cemeteries. Among other ports of call, they visited Turkey, including Gallipoli. The Courier-Mail version is close to Ulug Igdemir’s 1978 translation of Sukru Kaya’s 1953 Dunya interview recollection of what Kaya claims Ataturk told him in 1934 (the date according to Igdemir, though Kaya himself did not date the alleged conversation with Ataturk). Again, the main difference between Yeo 1964 and Igdemir 1978 is the lack of Johnnies/Mehmets/no difference in the former; Igdemir worked this line into his translation only after his correspondence with Campbell. Now, we come to the important contribution from the RSL papers. It is attached to a letter from Yeo to KV Newman, National Secretary, RSSAILA, dated 19 December 1960. (2) It is a copy of Bill Yeo’s official report of the 1960 world tour. It is a few pages of typescript, rather grubby, with the final page roughly torn off (well after the final line of typing, however). It describes, in mostly flat style, the group’s visits to various locations, its fraught relations with the tour organiser – the peppery Yeo was a difficult client – and the hospitality it received, particularly in Turkey. 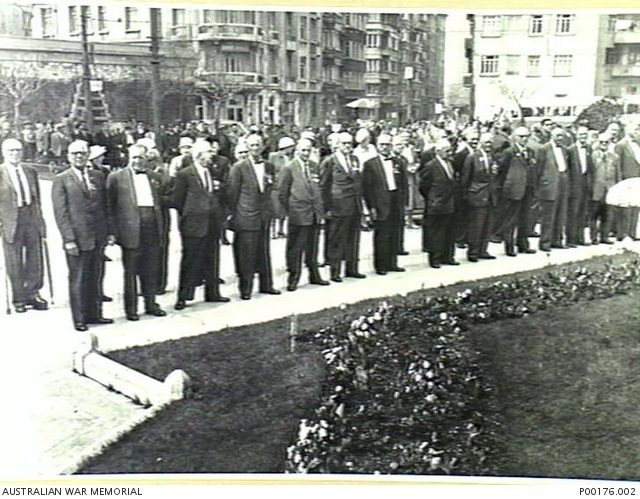 The report mentions the wreath laying in Istanbul on 22 April (the picture above), another wreath laying off Anzac Cove at 6.30 am on 25 April, the welcome from the local military commander and the Anzac Day march with Turkish veterans. It was [wrote Yeo] somewhat symbolical of the differences which passing years can make and of the peace and friendship which can be found during those years that the entire entourage sat down at a spot very close indeed to the actual landing place and ate together a picnic luncheon which had been prepared for us by our old enemies, the Turkish army. Cameraderie indeed. But – and this is the nub – there is no mention, no mention at all in Yeo’s 1960 report of the words that he quoted to the Courier-Mail four years later. As Holmes might have said, a ‘curious incident’. 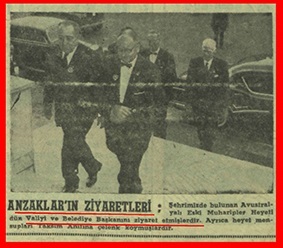 Perhaps the local military commander who met the visitors in 1960 passed on the ‘special message from the Turkish government’ that Yeo mentioned in 1964. But why did Yeo not include such a significant statement in his report to the national RSSAILA, under whose auspices the trip had been undertaken? Such a statement surely exemplified the good feelings and mutual respect surrounding the visit to Turkey of Yeo and his companions. Yet it does not feature in Yeo’s report. Finally, the Courier-Mail report reads as if Yeo was quoting from some sort of document or some record he made in 1960. If Yeo was able to show or quote it to the journalist in 1964, why did he not include it in the 1960 report or at least refer to it? The four-year discrepancy in the Yeo material adds to the impression of randomness and mess surrounding the ‘Ataturk words’. We’ll keep looking for evidence. The point is that these difficulties with evidence have often been ignored or glossed over by aficionados desperately wanting the ‘Ataturk words’ legend to be true. Some brain work is required to make sense of this small corner of Australian-Turkish history; the attractiveness of the sentiments in the words should not preclude this effort being put in. History is about evidence. Update 26 November 2015: Yeo’s presidential report for 1960 appears in the NSW RSL’s journal Reveille for 1 September 1961 at pages 7-8 (‘1960 was a year of achievement: presidential address to State Congress by Mr W. Yeo, C.B.E.’, pp. 7-8). The report does not mention the world tour. Sir Alan McNicoll (1908-87) was a senior naval officer who became Australia’s first ambassador to Turkey in 1968, remaining in the post until 1973. As well as the physical difficulties of opening a new embassy, he had to contend [according to his entry in the Australian Dictionary of Biography] with a lack of knowledge among people in both Canberra and Ankara of each other’s society and values. Despite these and other challenges he established a firm basis for cordial relations between the two countries. On 20 December 1969, McNicoll wrote a private letter to his friend, AGW (Bill, later Sir William) Keys, National Secretary of the RSL, noting how widely different were the Turkish and Australian views of Gallipoli. (3) The Turks saw the Dardanelles campaign as a resounding victory for their side and a defeat for the British Empire ‘and we are continually being asked why we make such a thing of Anzac Day’. McNicoll went on to discuss plans to present a ceremonial sword to a Turkish military cadet. He said the donors should avoid linking the symbolism of the sword solely to Gallipoli but should include a reference to Palestine, where Australia’s side won. McNicoll suggested appropriate words on the sword might be, ‘In memory of the battles fought between our soldiers in Gallipoli and Palestine, and in token of the friendship between Turkey and Australia which has happily replaced the conflicts of long ago’. He was writing privately to Keys; perhaps he was unable to consult Turkish acquaintances in Ankara about what words might work best. If he had, perhaps someone might have referred to the same set of words that Yeo recalled in 1964. Perhaps the ‘Ataturk words’ might even have come into the conversation as a precedent. While there are so many of Ataturk’s writings, speeches, and statements published during his lifetime that contain his sayings related to his views on world peace, is there any need to explain Ataturk’s pacifism and humanity by putting his signature under others’ poetic words, instead of just using his own words? (1) Oliver Harvey, ‘Ghosts at Gallipoli’, Courier-Mail (Brisbane), 25 April 1964, p. 2. (2) RSL papers, NLA MS 6609, Series 1, Box 300, Folder 4671C. (3) RSL papers, NLA MS 6609, Box 1089, Folder G116, Turkish matters 12/72. (4) Baris (Istanbul), 2 September 1972, translation courtesy Cengiz Ozakinci.